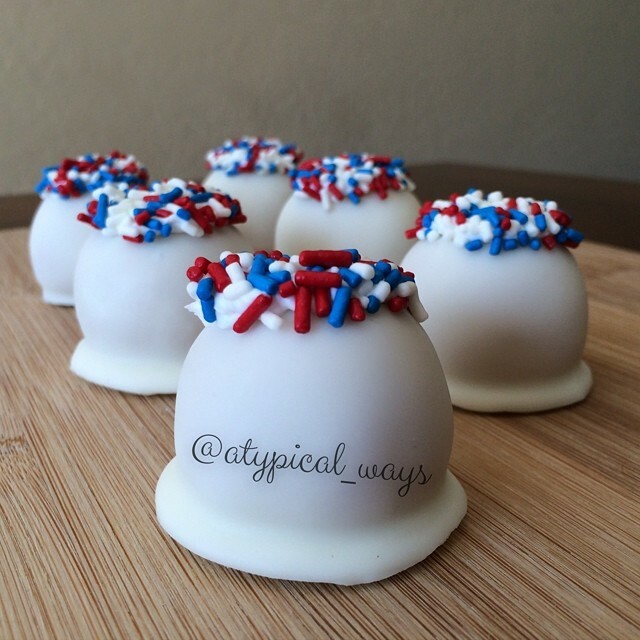 Red, White & Blue gluten free White Chocolate dipped Peanut Butter Truffles! Place chickpeas, nut butter, honey, vanilla & cinnamon in a food processor and blend until smooth. Remove to a bowl and place in the freezer for 45 minutes to harden. Remove from freezer and roll into large balls and place on parchment paper. Return to freezer again to harden for another 15-20 minutes as it will make dipping these in chocolate a lot easier. Melt chocolate wafers per package instructions and then using a toothpick and/or fork completely dip each ball into the chocolate. Shake off any extra chocolate and place on parchment paper and then back into the refrigerator for the chocolate to set. Optional prior to serving: top with a little white frosting and dip into sprinkles!